Brought to you by Steel River Playhouse in the heart of downtown Pottstown! Are your kids scrambling for AFFORDABLE summer fun? Steel River Playhouse still has some limited space available for summer camp for all grades, but especially for students in Grades 1 through 4. And now’s your chance to see what it’s REALLY like “behind-the-scenes.” Prospective campers and their families can sign up for free tours and Q&A sessions with the education department, starting THIS WEEK on Fridays, Saturdays and Mondays. Celebrating its 10th anniversary of providing quality, affordable performing arts summer camp for students in Grades 1 through 12, Steel River’s professionally-trained artists work with the campers to develop skills in voice, acting, comedy improv, and movement in a collaborative, noncompetitive setting. Prospective campers and their families are invited to tour Steel River and participate in a Q&A session by appointment. Tour and meeting hours are Fridays (3:00 – 6:00 pm), Saturdays (12 noon – 3:00 pm), and Mondays (6:00 – 8:00 pm). 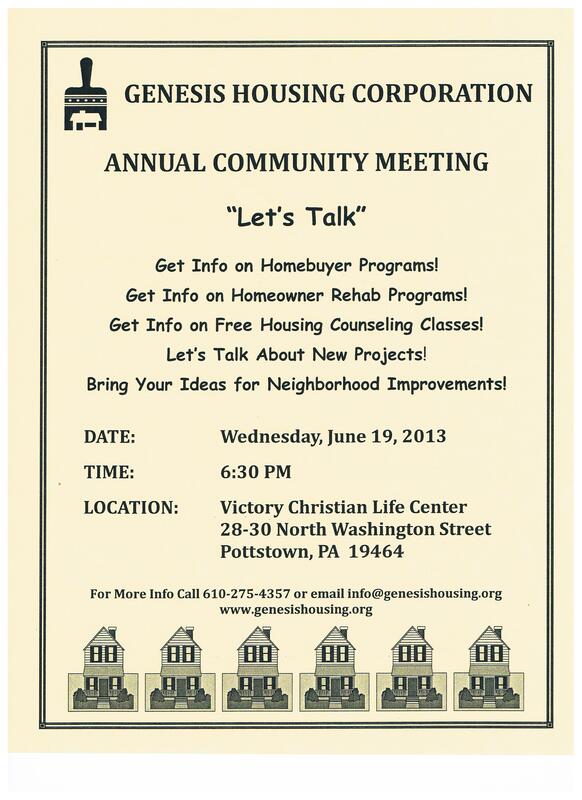 Please call Steel River at 610.970.1199 or email rebecca@steelriver.org to schedule your visit. For summer, campers can choose 2, 4 or 6 weeks of camp (in any combination) running July 8th through 19th, July 22nd through August 2nd, and August 5th through 16th. Camp fees run approximately $5 per hour. Younger campers in Grades 1 through 4 can choose morning, afternoon, or full-day camp ($209 per 2-week session for ½ day; $429 for full day). Camp for those in Grades 5 through 12 is Monday through Friday, 9:00 am to 4:00 pm ($419 per 2-week session). Current students can refer a friend and receive a $10 gift certificate! 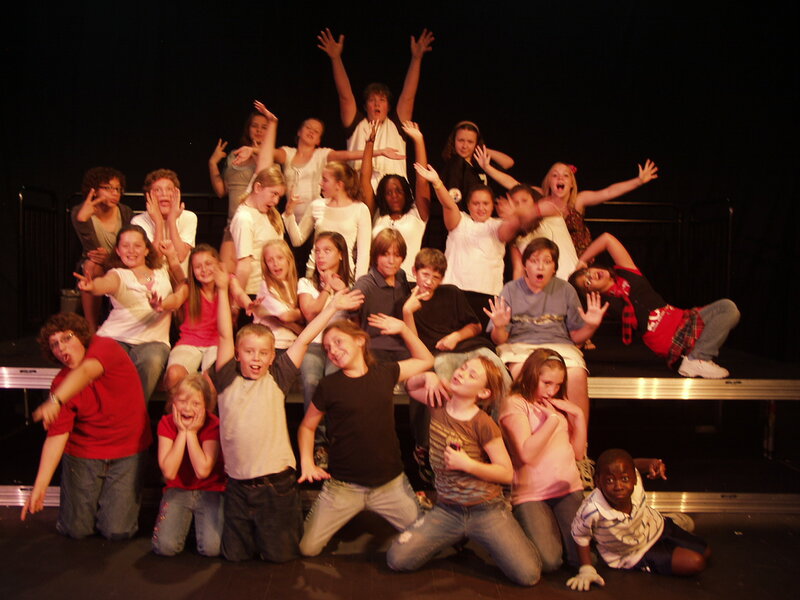 As a nonprofit performing arts center, Steel River Playhouse maintains low tuition rates (averaging $5 per hour), so that camp is accessible to as many students as possible. Financial aid is also available for those who qualify. More information is available at www.steelriver.org, or by contacting Rebecca Shoemaker, Operations Manager, at rebecca@steelriver.org or 610.970.1199. Steel River Playhouse is located at 245 E. High Street, Pottstown, PA 19464. Shown below at presentation of flags at Borough Hall: Frank Strunk, President of Pottstown Keystone Chapter 565 of Vietnam Veterans of America; Billy Worrell, of American Legion Post 244; and Mark Flanders, Pottstown Borough Manager. 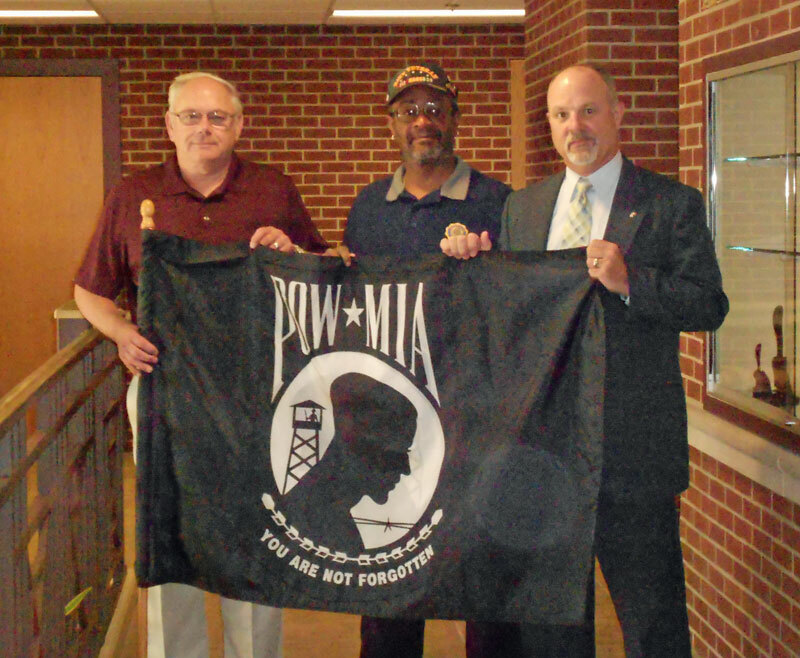 In preparation for ArtFusion 19464’s fall educational exhibit When We Were Soldiers, downtown Pottstown will soon be flying POW/MIA flags. The flags will be hung the week of July 4th and be on display through Veterans Day. This display was made possible through the support of the greater Pottstown community and beyond. Representative Mark Painter’s office donated 2 flags. Generous donations were also made by the following individuals and organizations: David Garner, Esq., Pottstown Vietnam Veterans Memorial Fund, Positively Pottstown, Federation of Concerned Organizations, POW/MIA Forget Me Nots, American Legion Post 244 and Jack and Cathy Paretti, Theresa Orlosky, Sharon Shulby. Billy Worrell, member of American Legion Post 244 and a Vietnam Veteran, was very instrumental in getting the donations and arranging the purchase of the flags. When We Were Soldiers will focus on the personal recollections of veterans of the Vietnam War. The show will open September 20 with a Welcome Home reception and run through Veterans Day. As part of the reception, local motorcycle clubs will be participating in a welcome home ride. The reception will run from 5-8pm. Light refreshments will be served. While this reception is free, ArtFusion will be collecting donations for a free arts program for veterans as well as to fund maintenance for the Pottstown Vietnam Memorial. The Pottstown Keystone Chapter 565 of Vietnam Veterans meets the first Tuesday of every month at 7PM at the VFW located on High Street in Pottstown. Anyone is invited to attend a meeting. 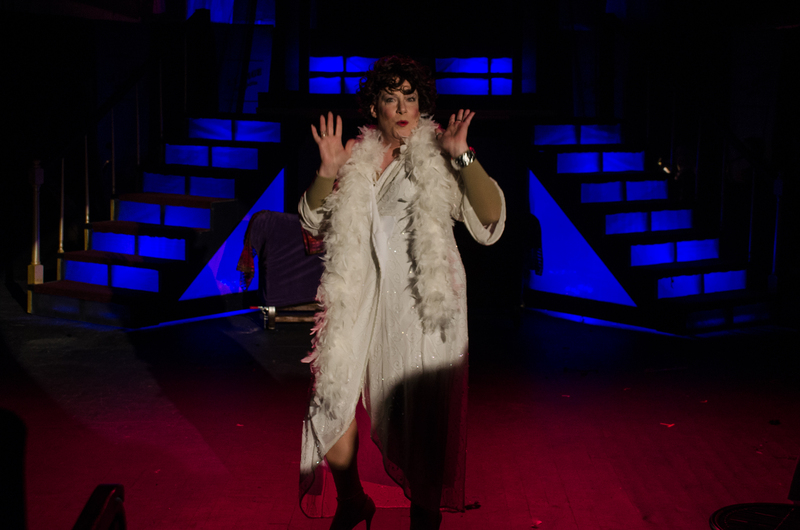 Please check out this review of Steel River Playhouse’s current musical La Cage aux Folles from guest blogger Parker Blaney. The original 1983 Broadway production of La Cage aux Folles won 6 Tony Awards and it has since won the Tony Award for Best Revival of a Musical twice, the only musical to do so, proving again and again that this story lives on. Thanks for covering it for us, Park! What a delight it was to see Pottstown’s own Steel River Playhouse production of La Cage aux Folles. I have to confess I usually don’t enjoy musical plays, but this one delightfully breaks all boundaries, in more ways than one! At its heart, this is a story about family, what it means to grow up and thrive in a community of love, and what happens when two families with different ideals are thrust together as the result of young, passionate love. Within the musical, Albin, a buxom drag queen, played by the wonderful Kirk Lawrence, is the star attraction of a show called La Cage aux Folles; he is also the star of the musical at Steel River. Lawrence’s voice ranges from the purr of a cat that builds to the roar of a wounded, suffering lioness. Georges, played by Robb Hutter, is his husband, and the manager of the show. He tugs at our hearts with his tender ballads of longing, recounting his and Albin’s youthful love. Their son—who is the biological son of Georges from a previous relationship with a woman—is Jean-Michel, played by David Landstrom. Jean-Michel has fallen desperately in love and wishes to marry Anne, played by Josephine Patane, the daughter of a local conservative politician. That’s where the trouble begins. Anne’s family demands to meet Jean-Michel’s family, and Jean-Michel doesn’t want Albin, effectively his mother for many years, to meet them out of fear the conservative politician will not only disapprove of their nontraditional family but also discover that Albin is the host of La Cage aux Folles, and thus refuse to give his consent. It is heartbreaking to see the dear, conflicted, vulnerable Albin react to Jean-Michel’s denial of him. This is the heart of the play—will the family defend its members as they are, or hide them away as if they are a kind of social leper? Well, suffice to say that events often run ahead of the best made plans, much to the delight of the audience. The conflict and its resolution are unexpected and yet believable. Also a show-stopper is the performance of Adam Newborn, who plays Jacob, the “maid.” His mad dashes onto the stage and his frolicking, wild energy take over his scenes. He is simply drop-dead funny. Newborn’s sense of comedic timing is impeccable and seamless. I had the sense I was watching someone special, someone I will see again in a much larger role in the future. 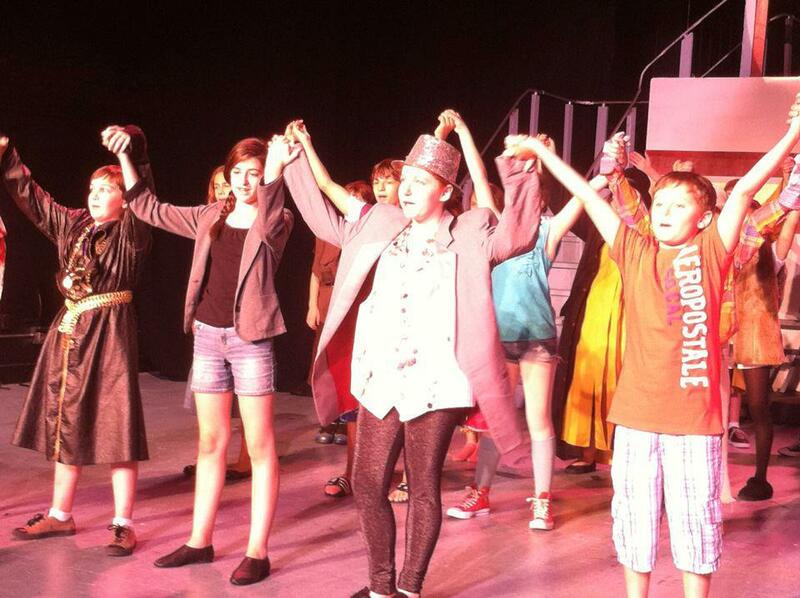 Indeed, all of the actors’ performances felt like they came out of a big-time production and not regional theater. Regional theater can sometimes feel slightly amateurish to me, but not here at the Steel River Playhouse. I can’t remember the last time I felt as wide a range of emotions as I did watching La Cage aux Folles. There are some rather mild sexual situations, but really the meaning of the play, the tension of being who we are versus what society might demand of us, is timeless. Its message never grows old and never fails to bring tears to my eyes. Please, there are only a few more performances of La Cage Aux Folles at Steel River Playhouse in downtown Pottstown. Get your tickets now for an abiding message about love, family and the soaring, enduring spirit of human relationships. La Cage aux Folles runs for one more weekend, through June 23rd, with performances on Thursday at 7:30 pm, Friday and Saturday at 8:00 pm, and Sunday at 3:00 pm. Tickets are $15 to $26, with special cabaret seating at $68 for a table for 2 (includes complimentary beverages and snacks). Tickets are available online at http://www.steelriver.org or by calling the box office at 610.970.1199, or at the door when available. Steel River Playhouse is located at 245 E. High Street, Pottstown, PA 19464. This info was posted at The Mercury yesterday. Click here to see the article and cool photos. “Young racers are getting ready to roll at the annual Soap Box Derby this Saturday. Sponsored by the Pottstown AMBUCS, the event is one of the most popular family events in the area. Crowds gather to watch the young drivers race down the Wilson Street hill. The Pottstown Soap Box Derby was first run in 1994 and is run on the third Saturday in June every year on Wilson Street between State Street and Farmington Avenue. A local Pottstown Girl Scout Troop is collecting new or used clothing that can be used as student uniforms in the Pottstown School District, such as white, light blue, or navy polo shirts, turtlenecks, certain sweaters and sweatshirts and navy blue or khaki pants, shorts, skirts, or skorts. All sizes. All uniforms will be donated to the Pottstown Cluster of Religious Communities to help children in Pottstown. Victoria Bumstead, who is the Volunteer Coordinator for the Cluster has indicated that uniforms are a huge need for their organization to support children in our community. For more information about Pottstown’s uniforms, policies, and assistance programs, click here. Mike’s Brick Oven Pizza at 601 N. Charlotte St.
and the North End Swim Club.